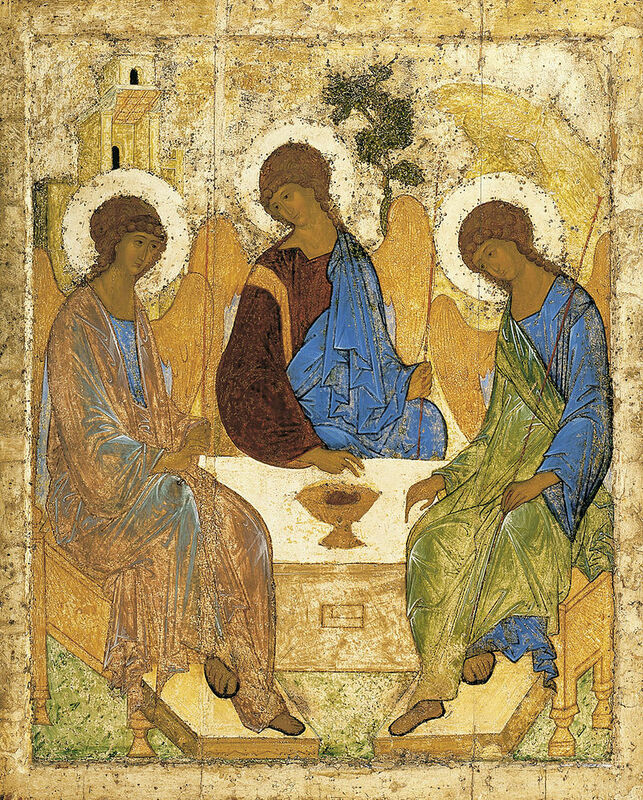 Andrei Rublev‘s famous icon of the Trinity (c.1400) represents the Holy Trinity by portraying three travelers visiting Abraham and Sarah under the oak of Mamre (Genesis 18). The calf alludes to Jesus’ sacrifice on the cross, and its being prepared as food represents the sacrament of the Eucharist. Divinity is shown in the colors of which the travellers are wearing and the staffs that they are holding. The main purpose of this piece is to show to depict the equality of the Holy Trinity and God’s master plan for creation. 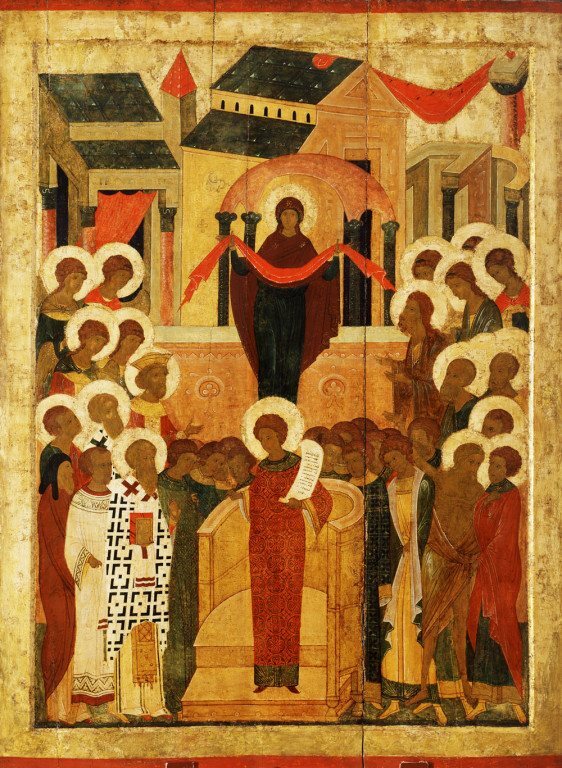 The icon is currently housed in the Tretyakov Gallory in Moscow. The Grapevine Cross is an important artifact to the Georgian Orthodox Church. The cross belonged to Saint Nino, a Cappadocian woman from the late 3rd century AD who spread Christianity to the ancient kingdom of Iberia. By using the cross to perform several miracles, the local king, Mirian III, proclaimed Christianity the state religion. According to the Georgian Orthodox tradition, Mary presented Saint Nino with a cross made out of grapevines. Saint Nino took the cross after she awoke from her vision and tied it together with her own hair. 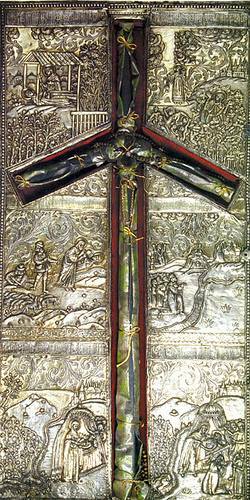 The cross currently resides in the Tbilisi Sioni Cathedral in the modern country of Georgia. The Theotokos of Vladimir is a Russian Orthodox icon dating back to roughly 1130. It shows the Virgin and Child and has remained in Russia for almost its’ entire existence. One of the oldest icons in Russia, it is highly respected and viewed by many as one of the greatest religious paintings. When the image was brought to the city of Vladimir, the Assumption Cathedral was built to house it. It is used for a variety of celebrations and ceremonies and is often copied. The Cincture of Theotokos is a Greek Orthodox relic with ties to the Virgin Mary. Cincture can be translated from Greek to sash, girdle or belt. According to sacred tradition, the Virgin Mary was buried by the Twelve Apostles in Jerusalem. Three days after she was buried, Thomas the Apostle wanted one last look at the body, and when he and the other apostles arrived, they discovered the body was missing. Some accounts say that the blessed mother appeared and presented her cincture to Thomas, yet there is no scriptural evidence. This supposed relic is kept in the Vatopedi Monastery on Mount Athos in Greece. This Russian Orthodox icon depicts a bearded St. Nicholas who is wearing an omophorion, the distinguishing robe of a bishop. He holds a gospel in his left hand and is preforming a blessing with his right. The painting is anonymous and is believed to have been created in northern Russia in the late 16th century. The two medallions next to St. Nicholas show Jesus Christ holding a gospel book and the Virgin Mary holding an omophorion. This refers to “the miracle in Nicaea” when Nicholas was imprisoned in 325. Christ and Mary appeared to Nicholas in his cell, granting him the gospel book and the omophorion, exhibiting his status as a bishop. He was immediately released. 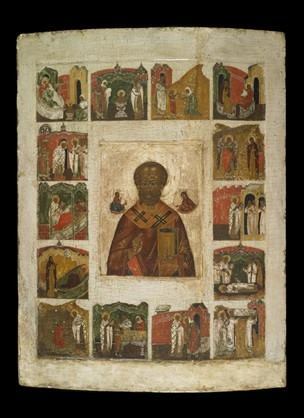 In addition, the icon has depictions of Nicholas throughout his life around the outside of the main painting. The Icon of the Protection (Pokrov Icon) is associated with the Feast of the Pokrov which is one of the most important feasts in the Orthodox Church. The holiday was established in the 12th Century by the Russian Church. It’s based on the rescue of Constantinople over 1000 years ago. During a vigil in the Blachernae church, the most Holy Lady Theotokos entered with a bunch of saints. She prayed for a long time and took off her veil and spread it over the worshippers to protect them and the city. The feast celebrates the Mother of God and the protection she gave and continues to give. All churches of the Orthodox world celebrate the Pokrov. It is celebrated on October 1st. “Protection of the Mother of God (Pokrov).” Holy Virgin Protection Cathedral Russian Orthodox Church Outside Russia Des Plaines, IL USA. Accessed October 1, 2015. http://www.english.holyvirginprotection.org/pokrov.html. 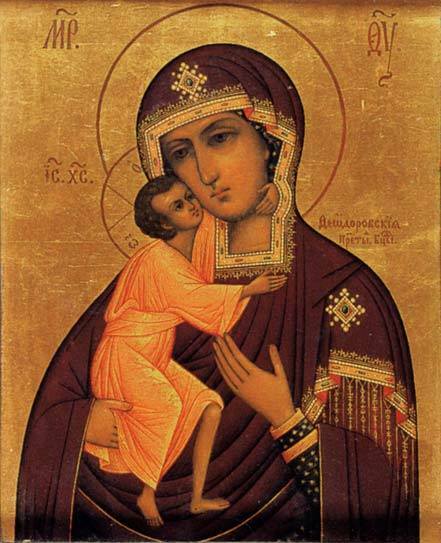 The Feodorovskaya Icon of the Mother of God is a symbolic icon to Russians, particularly Russians in the Volga region. The icon, also referred to as Our Lady of Saint Theodore and the Black Virgin Mary of Russia, was recognized as the patron icon of the Romanov family, the second imperial dynasty to reign over Russia. Although there is debate about when the painting of the icon was created, as it was painted over numerous times throughout history, art historians can determine when it received its fame. In 1613, the Russian tsar Mikhail Romanov was given a copy of the icon because his mother Ksenia was afraid that he would me murdered or “disregarded”, as the previous three tsars had been. Ksenia was optimistic that the icon would protect not only her son but also his royal descendants and subsequently the icon became known as the holy protectress. One of the most well known icons in Russia is that of Saint George, the patron saint of Moscow, slaying a dragon. The popular story is about a dragon that inhabited a lake in Libya. He was evil but worshipped by pagans who sacrificed their children to appease him. When the daughter of Queen Elisiba was to be sacrificed it was with great sadness. George, armed and on his white horse came to the rescue of the princess and said “In the name of the Father, the Son, and the Holy Spirit,” before striking the dragon. The horse trampled the dragon and George had the princess bind the dragon with her belt. Then they brought the dragon to the town where George killed him in front of everyone. Saint George saved the townspeople from a dragon that represented Satan so they converted to Christianity. The icon is a symbol of conversion to the Christian faith. 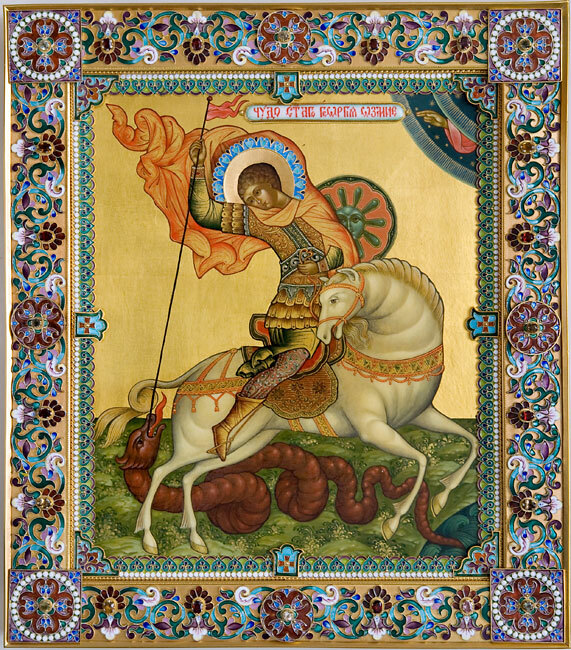 “Saint George and the Dragon in Iconography.” A Readers Guide to Orthodox Icons, 25 Apr. 2012. Accessed Oct 1, 2015. Sras. “Russian Icons in Detail.” Art in Russia. 24 Oct. 2011. Accessed Oct 1, 2015. 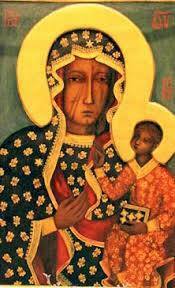 The Black Madonna of Czestochowa was apparently painted by St. Luke the Evangelist when Mary came to tell him about the life of Jesus. She is known as the Queen of Poland or “The Miracle on the Wisla” after thousands came to pray to her to help defeat the Russians. Pilgrimages continued during the Second World War under German occupation, and in increased significantly after the fall of communism. 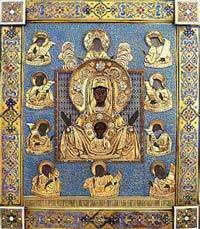 She is known as the Black Madonna due to soot residue from candles that discolored the painting. 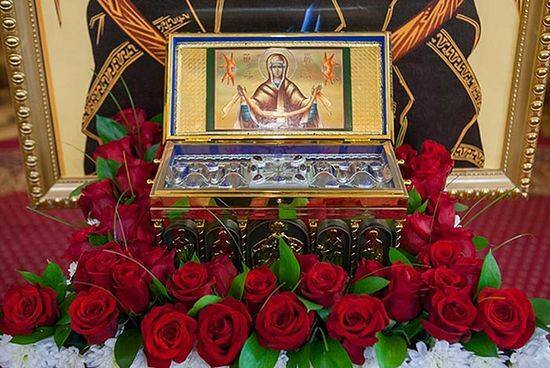 First discovered by a hunter in the woods of the village of Rylsk, the Theotokos of Kursk (or Kursk-Root Icon of the Mother of God) has been a longstanding symbol of divinity and miracle in the Orthodox Church, particularly for the people living in the area of Kursk. The icon was first discovered face down among the roots of a tree, and when set face up, it is said that a natural spring erupted where it had been. This event is celebrated on September 8th. The icon has been responsible for many other alleged miracles (including resistance to fire when burned by the Turks in 1383 and resisting damage by a bomb set by anarchists in 1898). Residents of Kursk are said to have experienced personal miracles of healing and good fortune after encountering the icon as well. 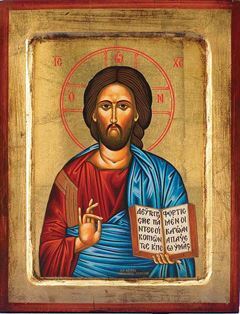 Though the icon now resides in New York City, it has been transferred to dozens of cathedrals and institutions in Russia since its discovery and been worshiped by several generations of faithful. 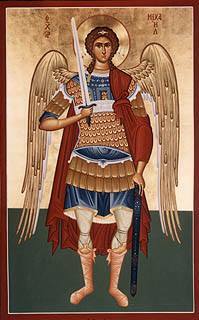 Archistrategos is a Russian Orthodox icon of the Archangel Michael, who is celebrated in nearly every form of Christianity. Michael is often considered the commander, or chief, of all angels and thus is one of the most highly recognized figures in Russian Orthodoxy. The icon is typically celebrated on Synaxis (November 8th) to celebrate his protection over humanity from war and violence. There are three typical depictions of Michael in Russian Orthodox iconography: one where he is represented holding a sword and shield, one where he holds a staff and an orb, and one where Michael is standing on top of a body which represents death, with outstretched arms holding a baby meant to represent birth. These images are meant to symbolize Michael’s authority as the commander of the angels. In many images Michael wears red robes and armor and can be seen defeating Satan who is usually depicted as a dragon. One of the most famous portrayals of Michael is his statue in Kiev, Ukraine where he is shown in exultation with his sword raised high. 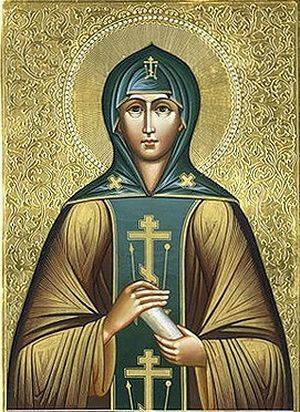 Saint Anna of Kashin was a Russian princess of the Rurik Dynasty. She lived from 1280 to 1368. Anna married Prince Michael Yarislavich of Tver in 1294. After Yarislavich died, she withdrew into Tver’s Sophia monastery. She was declared a saint in 1650, after she appeared to Gerasimus, a priest, during a siege of Kashin by Lithuanian troops. She is given credit for stopping the siege with little damage. Anna lamented the fact that people had not been honoring her tomb, when she has delivered the city from foreigners. Anna also said that she saved Kashin from other hardships. Anna told the Gerasimus to light a candle at her tomb. June 12 was established as her feast day in 1909. The icon of the Softener of Evil Hearts shows Mary, the Mother of God, in one of very few images of her not holding the baby Jesus. Instead, she is depicted with seven swords piercing her heart, representing the seven sorrowful events in her life. This why the icon is also referred to as “Seven Arrows” or “Seven Swords.” The sorrow Mary feels comes from the pain of seeing her son’s suffering, the seven swords are a symbol of the sorrow and pain piercing her heart. The icon is said to console or even heal those who come to pay respect to her, but those who secretly hide evil within them are unable to even approach her. In the 1920’s, Bishop Nestor established a church in the Far East in the city of Harbin to honor the icon of the Mother of God, “Joy of All Who Sorrow”. The bishop’s Russian assistant, Ekaterina Ivanovna Kurmey, donated an icon to the church, but the icon was ancient and darkened from time. No one could read the inscriptions or see the faces on the icon. However, Friar Julian Sumnevich began to see the icon lighten by itself. He claimed the icon renewed so quickly that it must have been a miracle; the icon became completely bright within one day. Because of this miracle, people have been coming to the House of Mercy in Harbin to celebrate the icon and pray to it; the icon is one of the most holy objects in Harbin. 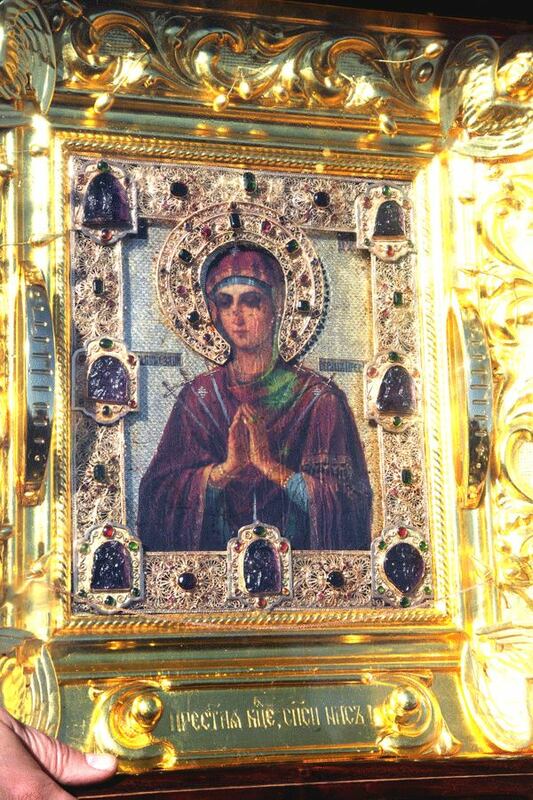 The Harbin Icon of the Mother of God “Joy of All Who Sorrow” now resides in the Synodal Cathedral of the Russian Orthodox Church. 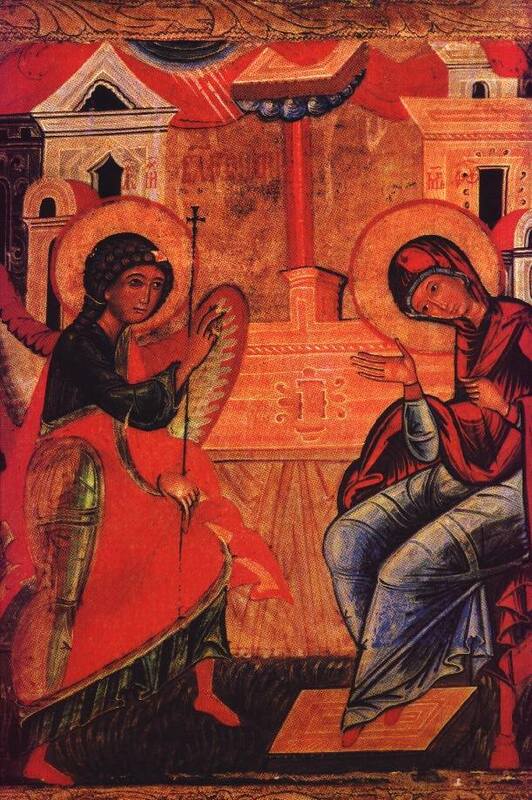 This sixteenth century painting found in Dalyova, Poland depicts the story of the Annunciation, a common scene found in many icons since fifth century Byzantium. Mary and the angel messenger Gabriel are present in the village of Dalyvona, bringing the divine to the domestic setting, a characteristic of Eastern European art. During the Annunciation, Gabriel tells Mary that she will have the son of God by immaculate conception. In this image he is descending with his wings half closed, landing on lush grass surrounded by a decorated background. The main color is gold, to represent a divine blessing upon Mary and to bring the scene into a different spiritual world, still resembling the area that the persons looking at the image would recognize. While Gabriel is telling Mary of her fate, her head is craned towards him, o sas to suggest readiness to his message. Gabriel holds a criterion in his left and hand blesses Mary with his right. They both have a golden nimbus around their heads outlined by a darker gold band. The Lesna Icon of the Mother of God is an icon currently residing in France, which has changed hands between the Catholic and Orthodox churches many times. It was originally found in 1683 by a shepherd, and has since been recognized for performing five hundred miracles. The icon’s feast day is held on the eighth of September. 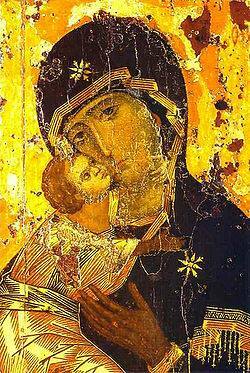 Source: “The Lesna Icon of the Mother of God,” Icons and Holy Places, Accessed October 2, 2015. The Christ the Pantokrator icon is also referred to as Christ the Teacher. Pantokrator means “all powerful,” or ruler of all. In this icon you can see Christ waving his left hand as if he is blessing someone or something and in his right hand is a jewel encrusted Bible. There are many explanations as to why one side of Christ’s face looks distorted and the other looking normal. You can find this portrait or artwork in churches throughout Russia and Eastern Europe.